The Giants have hit just 18 home runs this season, second fewest among NL teams (and with Giancarlo Stanton going to be sidelined for a while, the Marlins don’t figure to add many to their total of 12). But don’t tell the Arizona Diamondbacks about the Giants’ power shortage. Because against Arizona, it seems whenever the Giants need a big blast they’ve got one. For the fourth time in five games this season against the Diamondbacks, the Giants have hit a home run in the eighth or ninth innings to erase a deficit. On April 22, Buster Posey hits a two-run home run in the bottom of the eighth to tie the game 4-4. The Giants would win the next inning 5-4. On April 24 vs. Arizona, Brandon Crawford hits a solo home run in the bottom of the ninth to tie game 2-2. Arizona would win the game 3-2 in the 10th. So when Josh Wilson hit a solo home run, giving Arizona a 1-0 lead in the bottom of the ninth of Tuesday, the stage was set for some more late-inning thunder from the Giants. And thankfully, they got some help from Arizona manager Kirk Gibson. Gibson actually pulled a Bochy. After Wilson’s home run off Santiago Casilla in the eighth gave Arizona the lead, Gibson opted to let pitcher Trevor Cahill hit for himself with one out in the eighth. Despite holding a narrow 1-0 lead, the move appeared to be a sound one as Cahill was shutting out the Giants on three hits and he had only thrown 82 pitches through eight innings. Angel Pagan led off the ninth and worked the count full on Cahill before shooting a single into right field. That led Gibson to come get Cahill and bring in J.J. Putz. Pagan stole second, Marco Scutaro struck out, then Pablo Sandoval hammered a Putz pitch deep over the wall in right center for a 2-1 Giants led. 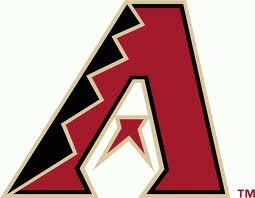 Sergio Romo would come in and set the Diamondbacks down in order in the ninth for his 10th save of the season. It game the Giants their 15th win in April. If the Giants win 15 games every month, they’ll win 90 games for the season. So the blast ended April on a positive note. It gives the Giants the chance to salvage the road trip with a 3-3 mark with a win Wednesday. And it means they didn’t completely squander seven shutout innings from Madison Bumgarner, who lowered his ERA 1.55. Nope. Nothing wrong. Belt was just batting eighth. Why? Well, it had to do with his history against Arizona pitcher Ian Kennedy. Belt was 2 for 15, which to me seemed like a pretty small sample over the course of two-plus seasons. But the bigger stat that factored in for Bochy was the nine strikeouts. So Bochy put Belt at No. 8. Maybe he was playing the numbers, which is a little curious because the numbers says Belt was one of the hotter Giants over the past week. But maybe he was simply trying to get a message to Belt to focus more on his approach against Kennedy … against every single pitcher he faces. If it’s the latter, it worked. Belt took a couple of pitches from Kennedy in his first at-bat, then turned on an inside fastball and sent it over the fence in right field for a home run. Belt finished 1 for 3 against Kennedy, flying out to deep right and center in his other two at-bats. In the eighth, Belt came up with two outs and the bases loaded. He worked the count to 3-1 against Brad Ziegler. He said the thought about taking another pitch in hopes of drawing the walk that would give the Giants the lead. Instead, he saw a pitch he liked and slapped it up the middle for a two-run single. Is that Belt talking? Or is it Bochy? Who cares, because right now it’s working. CAIN AND THE LONG BALL: The Giants got their first win in a game started by Matt Cain this season, although Cain didn’t get the win after surrendering three home runs in the fourth inning. It makes nine home runs Cain has allowed this season. But if there’s a trend, it’s that eight of those have come on the road … in hitter-friendly parks. His next two starts are at home, then May 16 … at Colorado … COLORADO. Hopefully, Cain will figure out how to keep the ball in the park by then. PANDA IN PAIN: Pablo Sandoval left Monday’s game in the sixth inning with pain in his troublesome elbow. It’s the same elbow that sidelined him more than a week during spring training and almost put his season-opener in doubt. Sandoval insists the move was purely precautionary and he wants to play Tuesday. Bochy was leaning more toward giving the Panda the day off. 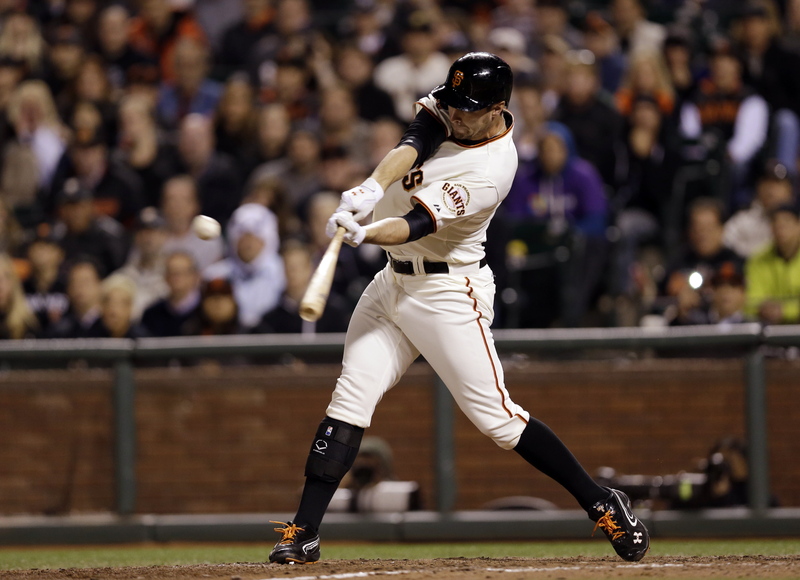 SWINGING SCUTARO: If you watched Monday’s game, you saw a rarity. Marco Scutaro, who almost always takes a first strike, swung at the first strike four times. The result was a 3-for-4 game with a double, a walk and two runs scored. It was almost as if Scutaro was using his own scouting report against the pitchers. Pitchers know Scutaro takes a strike, so they come early with fastballs. Knowing that, Scutaro pounced. Scutaro, who has been battling back stiffness early this season, was looking to break out of any early-season funk. His three hits Monday jumped his average from .222 to .237. The Giants went 1-5 last week, leaving them 13-12 for the season, 3rd in the NL West , 2 games behind the Rockies and Diamondbacks. Monday: Giants 5, Diamondbacks 4. WP: Romo (1-1); HR: Posey (2). Tuesday: Diamondbacks 6, Giants 4 (11). LP: Casilla (2-2); HR: Belt (1). Wednesday: Diamondbacks 3, Giants 2. LP: Gaudin (0-1); Crawford (4). Friday: Padres 2, Giants 1. LP: Lincecum (2-1). Saturday: Padres 8, Giants 7 (12). LP: Romo (1-2). HR: Crawford (5). Sunday: Padres 6, Giants 4. LP: Vogelsong (1-2). HR: Posey (3). Normally, coming into the week on a five-game losing streak, we’d be glad to have Matt Cain on the mound. He’s the stopper. But the Giants haven’t won a game in which Cain has started since Game 4 of the World Series. That makes five straight losses in Cain starts for the Giants, even though Cain is only 0-2 himself. And what has been biting Cain? The long ball. So having him start at Arizona’s Chase Field won’t make any fans feel any better. The Giants placed reliever Jose Mijares on the bereavement list after the death of his grandmother. Sandy Rosario was called up from Fresno, but may not be with the big club long as Jeremy Affledt is due off the DL some time this week. Monday: Giants (Cain 0-2) at Diamondbacks (Kennedy 1-2), 6:40 p.m.
Tuesday: Giants (Bumgarner 3-0) at Diamondbacks (Cahill 1-3), 6:40 p.m. The Giants lost two of three to Arizona last week, and the key to the losses for the Giants was failing to produce offense early in the game. The first two games included comebacks from deficits of 4-2 and 4-0 after the seventh inning. 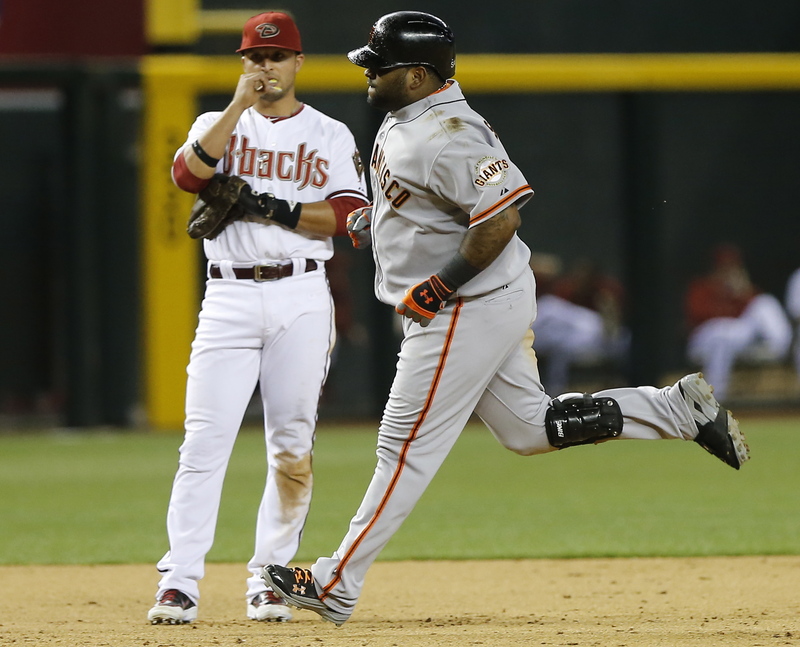 … The Giants went 4-5 at Chase Field last season, but won 4 of their last 5 games there after dropping the first four. … Each team will send only one pitcher in this series who pitched in last week’s series in San Francisco. Both fared well and pitched in the same game. Arizona’s Ian Kennedy went 6 innings, giving up 1 run on 4 hits with 4 strikeouts. Bumgarner went 7.1 innings, giving up one run on five hits with 7 strikeouts. … By missing Patrick Corbin and Wade Miley, the Giants miss Arizona’s two best pitchers by ERA. They meet Brandon McCarthy, who has struggled to a 7.48 ERA. Trevor Cahill is 1-3, but sports a nice 3.00 ERA. … It might not make you feel better about Cain pitching, but he’s 8-4 with a 4.13 ERA at Chase Field. … Arizona 1B Paul Goldschmidt is a Giant killer (7 HR, 23 RBI, .310 in 30 games). He’s particularly good against Giants pitchers who names rhyme with Wincecum (5 HR, 10 RBI, .588). Friday: Dodgers (Kershaw 3-2) at Giants (Zito 3-1), 7:10 p.m. The Giants took 2 of 3 in Los Angeles to open the season. … The Dodgers are expected to get SS Hanley Ramirez back in the lineup this week after suffering a hand injury during the World Baseball Classic. … The projected starters for the Dodgers is based on the notion that they’ll use their off day Thursday to skip their No. 5 starter. If they don’t, rookie Matt Magill will get the Friday start. But with Chris Capuano due back from the DL early next week, they’ll likely just skip the No. 5 spot. … If that’s true, the Giants will face Clayton Kershaw on Friday. Kershaw has enjoyed more success against the Giants than any other team. He’s 9-4 with a 1.28 ERA in 17 starts against the Giants. … It’s a good thing that Barry Zito is slated to face Kershaw on Friday. Zito has not allowed a run at home in three starts this season. He’s averaged 7 innings in all three home starts, yet has only throw 6.1 combined innings in his two road starts. … The Dodgers broke camp with 8 starting pitchers. But they have since traded Aaron Harang and lost Zach Greinke, Chad Billingsley and Chris Capuano to the DL. Remember last year when Brandon Crawford finished second in All-Star voting at shortstop, and people cried out injustice. Well if he finishes second again this year, they may cry injustice again … but this time because Crawford didn’t finish first. It’s still early, but Crawford still building a season with All-Star credentials with the bat to go with his soon-to-be Golden Glove. Crawford delivered an RBI double to right-center in the seventh, giving the Giants a 1-0 lead. After the Diamondbacks rallied to take the lead in the ninth, Crawford smacked a solo home run to right to tie the game. So who is leading the Giants in hitting this season? Brandon Crawford (.320). 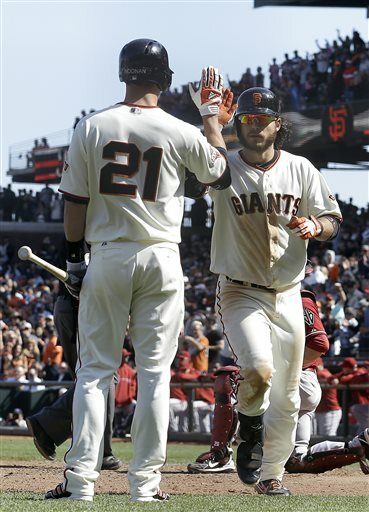 Crawford’s late inning heroics — it was the third time in three games that the Giants tied the game in the eighth or ninth innings with a home run — went for naught as the Diamondbacks tallied a run in the 10th for the win, and to take the series. But that was only because Crawford didn’t get a chance to bat in the 10th. He was on deck when Joaquin Arias made the final out. Despite the series loss, the Giants still had a 4-2 homestand, maintaining their pace of winning at home (8-4) and playing .500 baseball on the road (5-5). Bochy did his let-the-pitcher-hit-only-to-yank-him-in-the-next-inning strategy again. With a runner on third and one out (and the Giants leading 1-0), Bochy let Bumgarner hit. He struck out. The next half inning, Bumgarner was lifted after allowing the tying run to score with one out. I would have preferred to see Bochy get that run in from third, then hand a 2-0 lead over to the bullpen. Sketchy defense hurt the Giants again. Arizona’s ninth-inning rally was started with two outs when Angel Pagan misread a pop-up by Didi Gregorious. Instead a fly out to shallow center and the third out, Pagan went back at first and the ball dropped for a hit. To make matters worse, Pagan didn’t react quickly enough to make a play on Gregorious as he tried to take second. 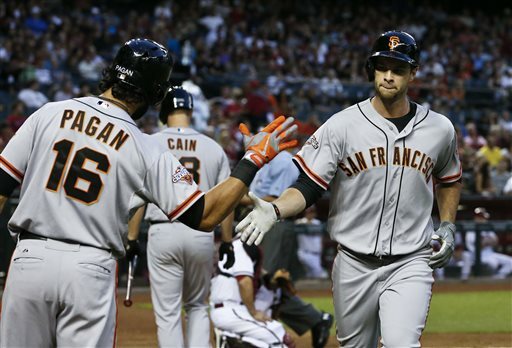 Giants 5, Diamondbacks 4: Buster Posey is heating up; Is Brandon Belt next? After the Giants tied the game in the eighth inning and two out, Joaquin Arias came up against right-hander David Hernandez. Arias got his second consecutive start at first place against a left-hander in place of the struggling Brandon Belt. But with a right-hander on the mound in Hernandez, I wondered why manager Bruce Bochy didn’t replace Arias with Belt in the eighth. But Bochy showed why he’s a better manager than I am. In the top of the ninth, after the Diamondbacks put the go-ahead run on second, Bochy made the double-switch. In came Sergio Romo from the bullpen for Jose Mijares. The other part of the double switch was Belt in for Arias at first base, meaning Belt would bat third in the bottom of the ninth. After Romo ended in the top of the ninth on one pitch, Andres Torres led off the bottom of the ninth with a single. Brandon Crawford sacrificed him to second, bringing Belt to the plate. Belt came into Monday batting .183. Not great, but there had been signs of improvement. Over his previous six games, Belt was hitting .294 (5 for 17), but six of his 12 outs were by strikeout. Bochy along with hitting coaches Hensley Meulens and Joe Lefebvre met with Belt during batting practice Monday, telling Belt to slow down his body movements at the plate. Well, the advice worked, as Belt slapped a pitch from Tony Sipp into left-center for a game-winning single. “When you get to this point you feel like you’ve heard a lot of things, but sometimes you forget it, and it’s nice to have another set of eyes to remind you,” said Belt, who added that Monday’s single was his first big-league walk-off hit. Despite the big hit, it’s unlikely he’ll be in the lineup Tuesday, as Arizona sends another left-hander in Patrick Corbin. Look for Posey at first base, with Hector Sanchez or Guillermo Quiroz catching Matt Cain. Posey took a shot to the neck off a foul ball in the second inning. But Posey also delivered some shots to the ball with his bat. His first-inning double helped the Giants tie the game 2-2. He also had another RBI double in the sixth inning when he was robbed by a nice catch by former teammate Cody Ross in his first game at AT&T since leaving the Giants as a free agent after the 2011 season. But Posey got the last laugh, blasting a two-run home run over the center-field wall, tying the game against at 4-4. It was Posey’s second home run in as many games. The normal mild-mannered Posey even showed a little emotion with a pump fist around the base paths. We figure he’s earned a day off from catching duties for that. Sure, the Giants ended up losing to the Diamondbacks Tuesday. But the Dodgers also lost, preserving the Giants’ lead in the NL West to 4.5 games and reducing their magic number to clinch the division to 22. But we’re MoreSplashHits, so we can let a Splash Hit go by without by homage to it. In the Xth inning, Brandon Belt got a hold of an Ian Kennedy pitch and sent it deep into the night, over the wall and into the bay on the fly — the 62nd Splash Hit at AT&T Park. The last three Splash Hits have come off the bat of Belt: Sept. 27 of last season vs. the Rockies, June 14 vs. the Astros and Tuesday night. Belt’s three career Splash Hits put him in sole possession of third place for the most Splash Hits, behind Barry Bonds (35) and Pablo Sandoval (6).